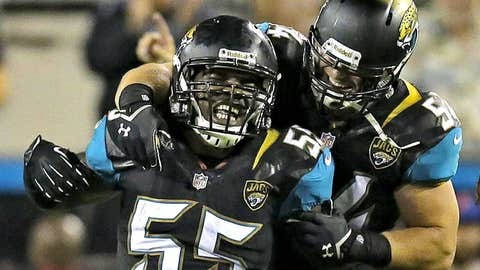 The Jaguars have won their last 4 of 5 games. The Jacksonville Jaguars lost starting quarterback (Blaine Gabbert: benched), first-round left tackle (Luke Joeckel: injury), star wide receiver (Justin Blackmon: suspension) and their first eight games. The Jaguars (4-9) never lost their will. First-year head coach Gus Bradley’s group got off to a hot start in Thursday’s 27-20 win that even a last-ditch Matt Schaub effort couldn’t overcome. Off to a 4-1 record in their last five games, there is hope in Jacksonville. Chad Henne, who finished 12 of 27 for 117 yards and two touchdowns, piloted a 13-play, 75-yard scoring drive in the first series of the game. He also showed off ability to make plays with his feet converting key third downs early. An opportunistic defense, steady run game and a solid special teams contribution would prove to be too much for the Texans (2-11). Matt Schaub completed 19 of 29 passes for 198 yards and a TD. 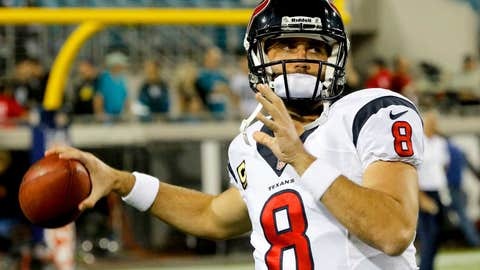 Veteran wide receiver Andre Johnson said after the game that Schaub, who replaced quarterback rookie Case Keenum midway through the third quarter, provided a spark. He did. In fact, he did enough to get back into the starting quarterback conversation, head coach Gary Kubiak said via The Houston Chronicle. After three straight incomplete Keenum passes, Kubiak made the decision to go with Schaub. The 10th-year veteran immediately took charge and changed the pace of the game. Completing his first 6 of 7 passes and connecting with tight end Garrett Graham for a 5-yard score, the Texans had life. Unfortunately for Schaub, he ended the game with an interception to Jaguars linebacker Geno Hayes, but it wasn’t indicative of his play. Whoever the coach is in Houston, Schaub’s $14.5 million price tag in 2014 will be tough to digest. It’s important that if he retains the starting job for the last three games of the season, he puts some good play on tape. Maurice Jones-Drew had 14 rushes for 103 yards. 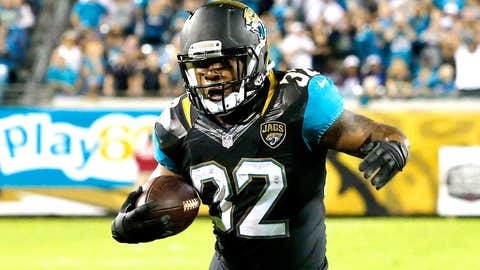 It figures that Maurice Jones-Drew would have his best game of the season and then leave with a hamstring injury. The eight-year running back said the move to keep him out of the game was “precautious” and that he’ll be ready to play against the Bills next week. Jones-Drew racked up 103 yards on 14 carries and even had two receptions for 20 yards to help stabilize the offense. With three games left on his current contract, he’ll have some big decisions to make this offseason. Should he take less and play for an immediate contender or take the best deal possible? Offensive coordinator Jedd Fisch didn’t have to dig too deep in his bag of tricks for this one. Jaguars rookie wide receiver Ace Sanders has been garnering some recognition for his playmaking ability and he put it on display. The rookie wide receiver threw a 21-yard beauty to Jordan Todman for the score. Sanders rounds out a solid rookie class including Jonathan Cyprien, Dwayne Gratz and Josh Evans who all have starting roles with the team. Evans didn’t play in Thursday’s matchup because of a shoulder injury. Is it inappropriate to show Teddy Bridgewater highlights in Houston? If the season ended this week, the Texans would own the No. 1 overall pick. The NFL Draft is more than five months away, but some fans in Houston are already thinking about next season. And when Louisville quarterback Teddy Bridgewater is making plays like this on the same night, it’s hard to not dream of the possibilities. Fourteen penalties for 177 yards would suggest the Texans lack some leadership. Kubiak placed the blame for the “gut-wrenching” 11-game losing streak on himself. It has been an ugly season in Houston and they’ve finally been mathematically ousted from the NFL playoff picture. The 4-9 Jaguars have NOT been mathematically eliminated from the playoffs. Somehow still alive. Need a lot of help, clearly.